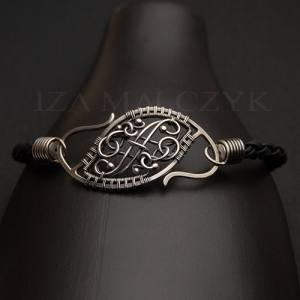 Unique bracelet with a clasp handcrafted in oxidised and polished fine and sterling silver. The bracelet was built on a 5mm black braided leather cord. The ornate clasp is 4,5cm long and 2,5cm wide. The bracelet now fits 18-20cm wrists but can be adjusted upon request.